Nedmag MgCl2 TECH is a high performance dust control and soil stabilization liquid product. It is designed for dust suppression and to extend the life of your gravel roads and surfaces. Composed of all natural magnesium chloride (MgCl2), Nedmag MgCl2 TECH works by binding fine dust and aggregate particles to keep surfaces stable and dust free. 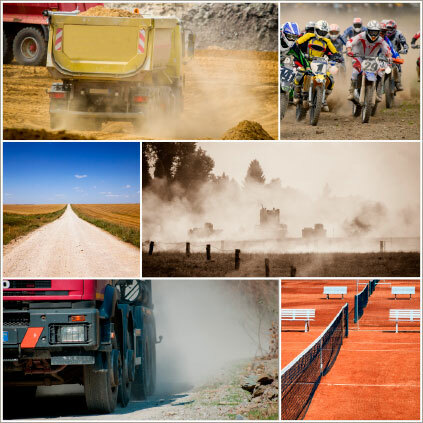 Dust control is crucial in maintaining the safety, utility, and integrity of unpaved surfaces such as roads, parking lots, recreational surfaces, landfills, quarries, farms, etc. Nedmag MgCl2 TECH The hygroscopic properties of magnesium chloride keep the ground moist/damp providing maximum control of dust and dirt. Nedmag MgCl2 TECH attracts moisture from the air and its surroundings, keeping unpaved surfaces damp, reducing dust. Nedmag MgCl2 TECH binds the dust, preserving road stability and extending road life. Nedmag MgCl2 TECH requires no pre-wetting, simplifying application, reducing cost and providing surfaces with faster protection. Create safer road conditions by increasing driver visibility. Promote healthier air quality for people, pets and plants by protecting against the health threats of fugitive dust which can aggravate respiratory problems. Reduce costly soil erosion and loss of aggregate resulting in longer lasting, safer roads and surfaces. Prevent fugitive dust from washing off into streams, creeks and lakes improving water quality. Application rates vary based on soil type and traffic volume; typical application rates range from 1.0 to 2.5 liters per square meter. Follow up applications rates are applied at half the initial dosage. Safe to handle, Nedmag MgCl2 TECH will not cause burning or stinging and is free of toxic metals and substances. Nedmag MgCl2 TECH is mildly corrosive to steel and aluminium. Preferred materials for storage and handling equipment are polypropylene, polyethylene and polyester. Nedmag MgCl2 TECH magnesium chloride is safe for the environment. This naturally occurring product is approved in a number of EU countries for all farming uses including organic farming and feed for animals.